Some people have raised their voices in concern about the level of violence in The Hunger Games. As a young adult book, they feel, the plot of kids killing kids for entertainment*, might be taking it a bit too far. My reaction. Instead of hiding the violence, use it as a way to start a discussion of violence perpetrated and brought upon children. Fiction has always shown us what happens to children in violent situations. One of the oldest examples comes from the Kalevala, the Finnish national epic. Kullervo was born to the only survivor (he thinks) of his tribe's massacre. His uncle caused the death of his people because of a dispute with Kullervo's father. When Kullervo is three months old, he is uttering vows of revenge. His uncle tries to kill him three times, but each time Kullervo is saved by his magic powers. His uncle waits for Kullervo to grow up and sells him to slavery to Ilmarinen. Ilmarinen's wife enjoys tormenting Kullervo. When she gives him the job of sheep herder, she gives him lengthly instructions about how to protect the herd, and a loaf of bread that she has baked stones in to. He breaks his heirloom knife on the stones, loses his temper, and makes a cow she was milking turn into a bear. He escapes. Kullervo goes on to more adventures, each one becoming worse for him. Finally he orders a magic sword to kill him. Vainomoinen (one of the central figures in Finnish mythology) hears the tale of Kullervo. He gives the warning that children should not be mistreated. Or they will grow up to be evil and without wisdom. This was one of the few myths that discussed child abuse. Kullervo could have been a great magician, but because of the treatment he received he became a violent adult. It stands out because it shows how abuse can affect the way someone grows up. But Hunger Games is children killing children. One of the first books I read that dealt with that was Lord of the Flies. The British school boys who were survivors of a plane crash, try to survive on a deserted island. Through the course of the book, the boys become more savage. Until one of them is killed when he is stabbed to death by most of the other boys, during a "war dance". Another boy is killed with a boulder. When the boys are rescued, they are chasing another boy through the jungle to kill him. In The Lord of the Flies, the boys revert to a savage nature. At first they try to live in a civilized way, but as the novel progresses, the stronger and more violent boys take over. Is it a book that shows that children need adults to keep them in line, or is it showing us, that we are not far from our violent nature? But the kids kill for entertainment? 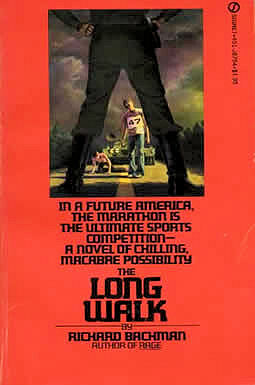 The Long Walk by Stephen King (under his pseudonym Richard Bachman) is a similar story. One hundred teenage boys take part in an annual walking contest. They are given a set of rules, failure to follow the rules will result in them being killed by soldiers. Like Hunger Games, The Long Walk is a spectator event run by a dystopian government. The violence in Hunger Games is an old tale. Instead of complaining about the level of violence. Use the story as a way to open a dialog with the young adults about how violence affects them. Discuss how reality TV shows can affect people that watch them. Discuss what "bread and circuses" means. Is it alright to be entertained by such stories? Yes, as long as it leaves you pondering the questions brought up by the story. *That is an oversimplification of the plot. Labels: Hunger Games, violence, young adult.